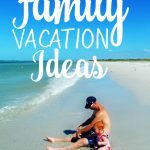 As I mentioned recently, we visited Sleeping Bear Dunes National Lakeshore as a family for a week in June and had a great time. 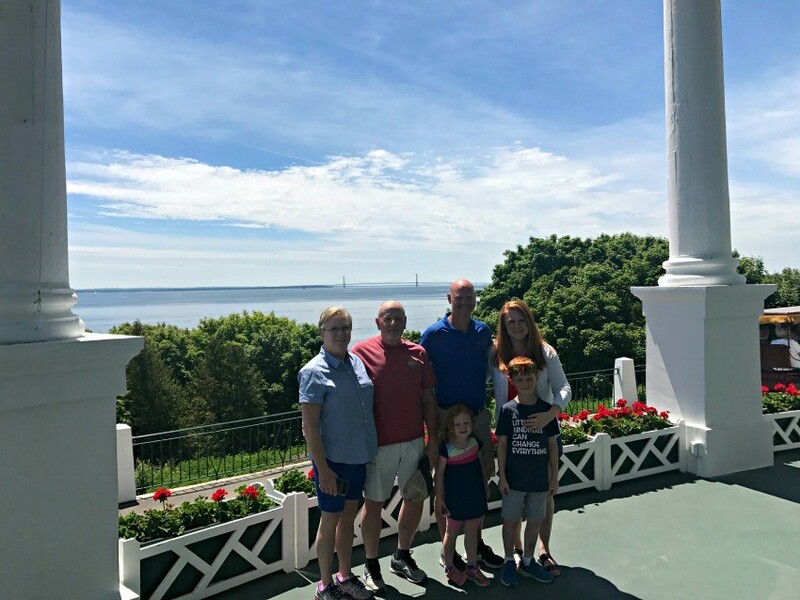 During that time we visited Mackinac Island, which was TRULY a treat. The island is so quaint and unspoiled with gorgeous buildings and homes and is even more unique in the fact that cars and vehicles are not allowed on the island! So you get loads of bicycles and horse drawn carriages all over the island. 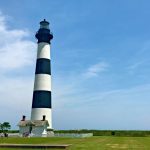 Because it’s unfettered with cars, it’s a great place for families to visit and allow your kids to ride the island and explore the roads without the fear of car traffic! 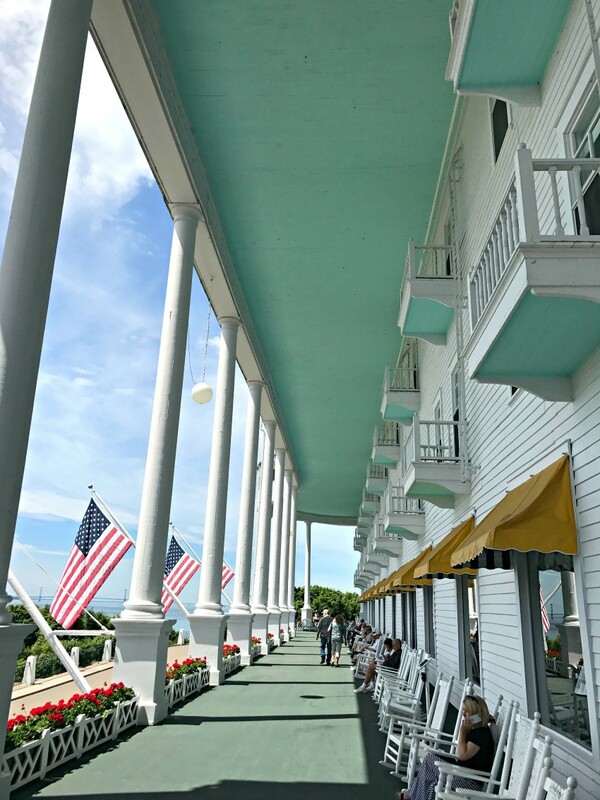 We had a great visit and below I’ll share why you need to visit Mackinac Island and tips for visiting the island if it’s your first time, like us!! You can’t drive to Mackinac Island being that it’s an island and all 😉 so you’ll have to catch a ferry over. I recommend Star Line Ferry Terminal on the St. Ignace side. 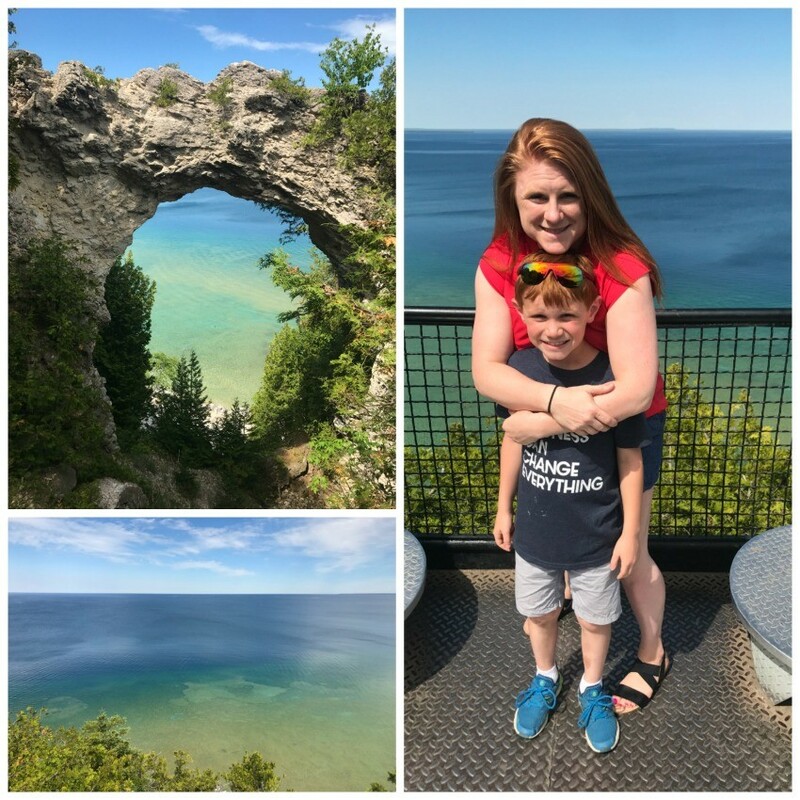 First, it’s cool because you get to drive over the Mackinac Bridge, which is super impressive, and second because on some of the ferry returns they drive you under the bridge so you can get an up close and personal view of the bridge! Star Line is an easy ride over and you can sit inside or out depending on how wind blown you want to be when you arrive in Mackinac. 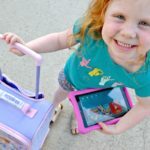 Once you get to the island, you’ll have a hard time deciding where to start because there are so many fun things to do on Mackinac Island! 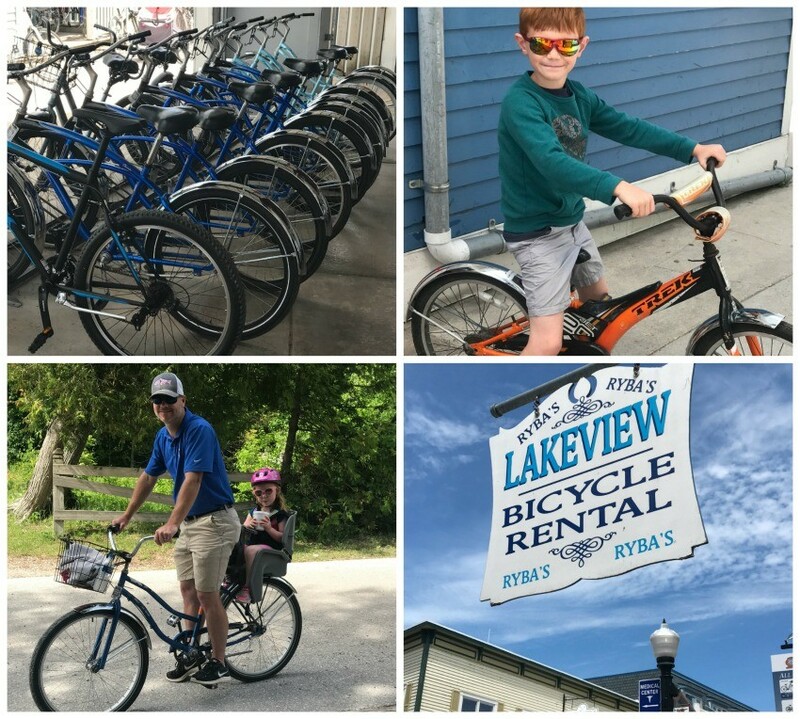 For us, we headed right off the Star Line Ferry and over to Ryba’s Lakeview Bicycle Rentals to grab bikes. I highly recommend getting bikes and touring the island with them!! The roads are very flat (with the exception of a hill on the way to the Grand Hotel) and people of all ages can enjoy. My 65 year old parents biked with us all day with no trouble. My eight year old son LOVED the freedom of biking the island and our daughter enjoyed riding the day with her daddy in front. Once you get your bikes, I’d encourage you to head onto the 8.2 mile bike path that circles the island. And before you say, “8.2 miles?! You’re nuts!” Trust me. I felt the same way. Then all of a sudden we were 4 miles in and taking a break and I was SO glad we made the decision to go around!! It’s flat, full of stunning views, and is so relaxing. I literally did it in a pair of sandals and shorts, so don’t feel like you have to be a professional cyclist to enjoy this leisurely ride. There is a drink/ice cream/refreshment stand around the 4 mile mark too along with a bathroom. Visit HERE to see a map of the island. Just outside of town is Arch Rock. It’s one of the MUST SEE’s on Mackinac Island. Although it’s a bit of a hike to get up there, it’s a STUNNING view and totally worth it! Don’t miss these amazing views of crystal clear, bright blue water! The downtown area is full of shops…and I believe I counted at least 15-20 of the exact same four fudge shops. 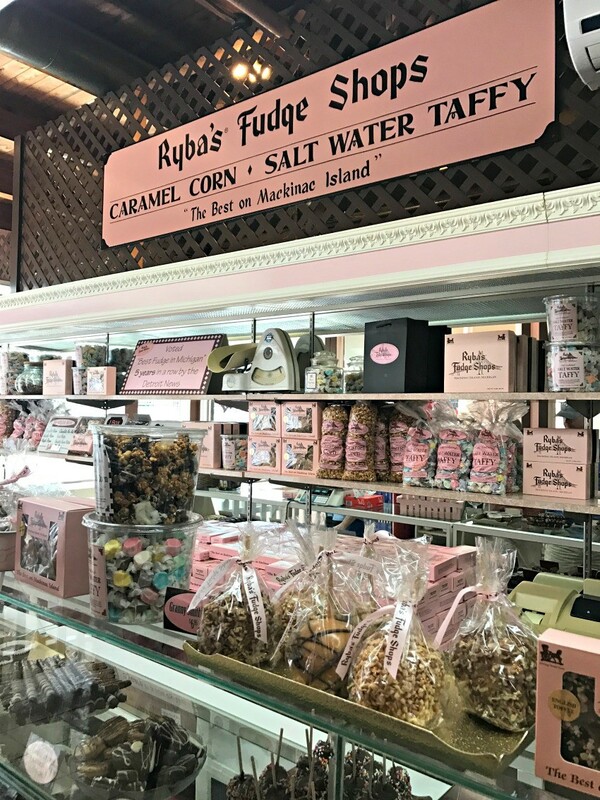 BUT Mackinac Island is known for the world’s best fudge, so once you’ve grabbed enough souvenir t-shirts, pick up a pound of fudge from Ryba’s Fudge Shop and enjoy a sweet treat! 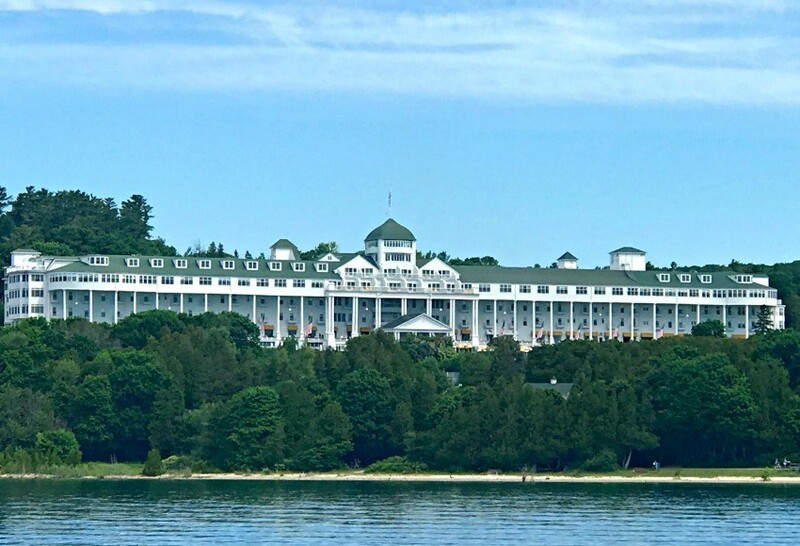 If you’re looking for Mackinac Island hotels, the one hotel that will likely hit the top of your list is the iconic Grand Hotel of Mackinac Island. 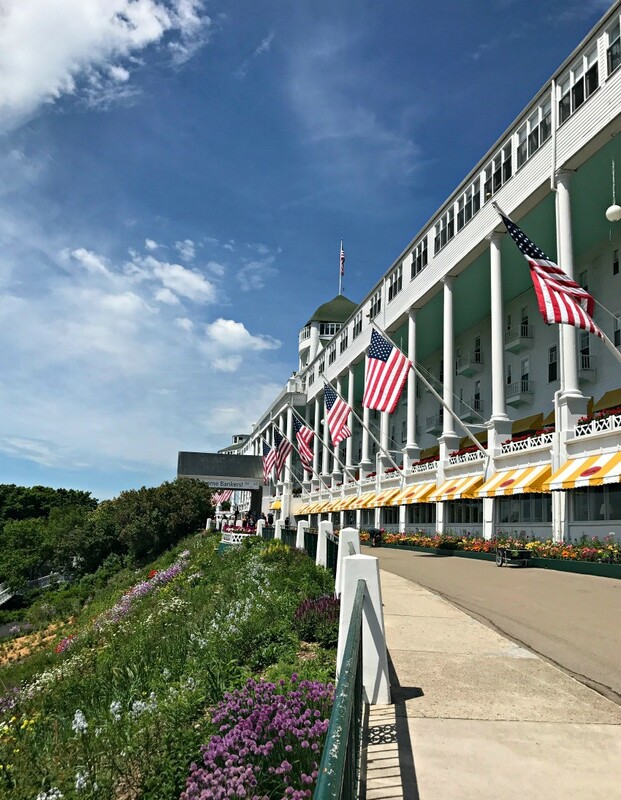 The Grand Hotel hosts thousands of guests a year and is so amazing and one of a kind. 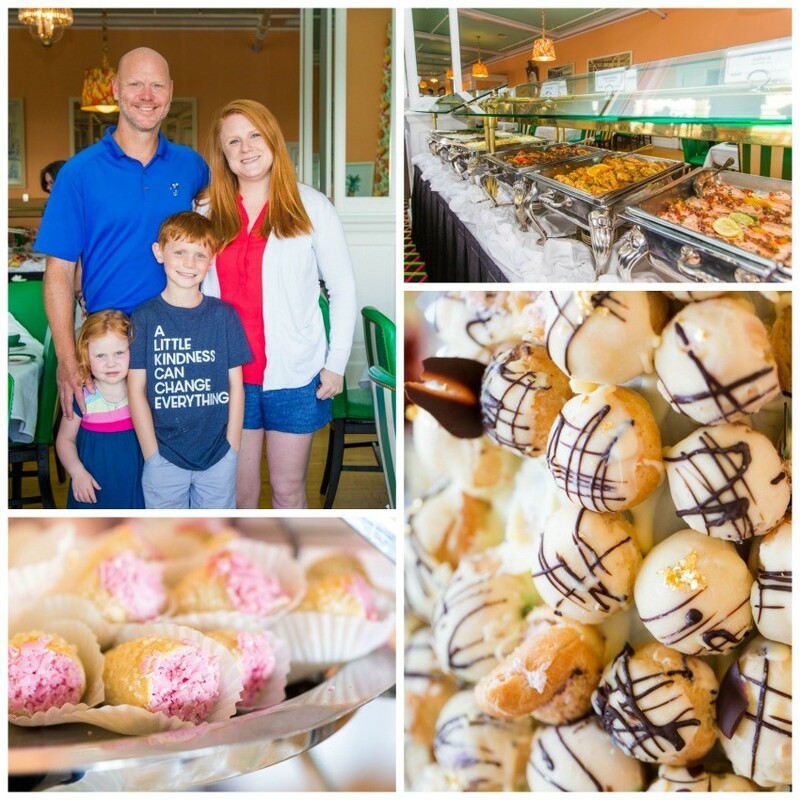 We visited the Grand Hotel and enjoyed their top notch lunch buffet with my family while we were on the island. Then after we toured the hotel and the grounds as special guests of the hotel. *Note: You either have to pay a fee or be a hotel guest to walk around the grounds normally. I’d also like to take a minute to thank the Grand Hotel for hosting us for a visit and for lunch. 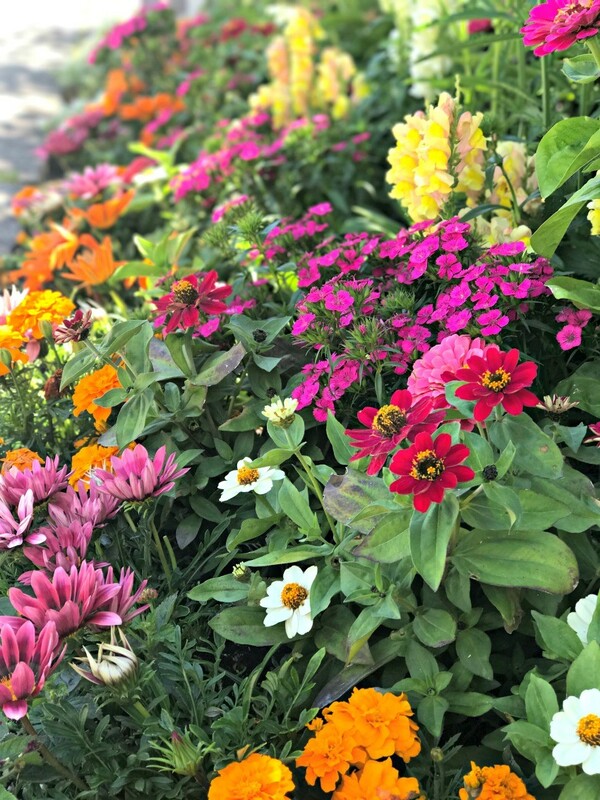 The hotel takes you back to another era with it’s gorgeous decor, high class service, and beautiful gardens and grounds. 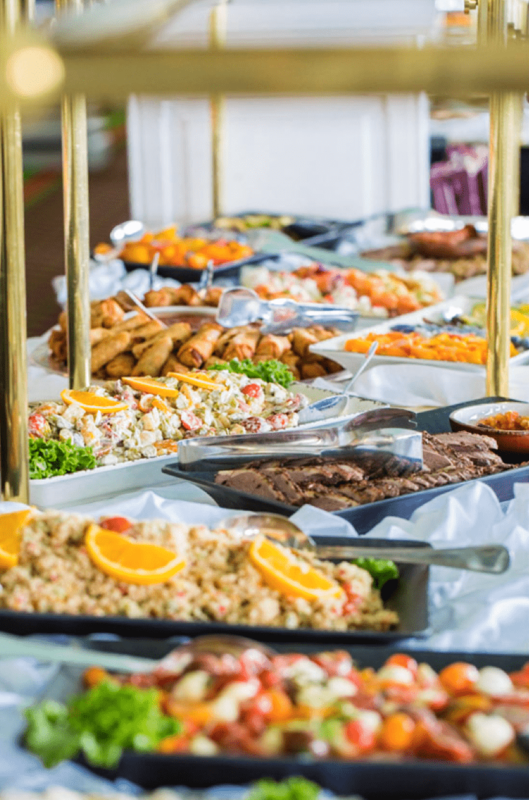 The food in the lunch buffet isn’t your “everyday buffet”, we’re talking high end pastries and dishes made by top notch chefs in a stunning dining room fit for a queen. 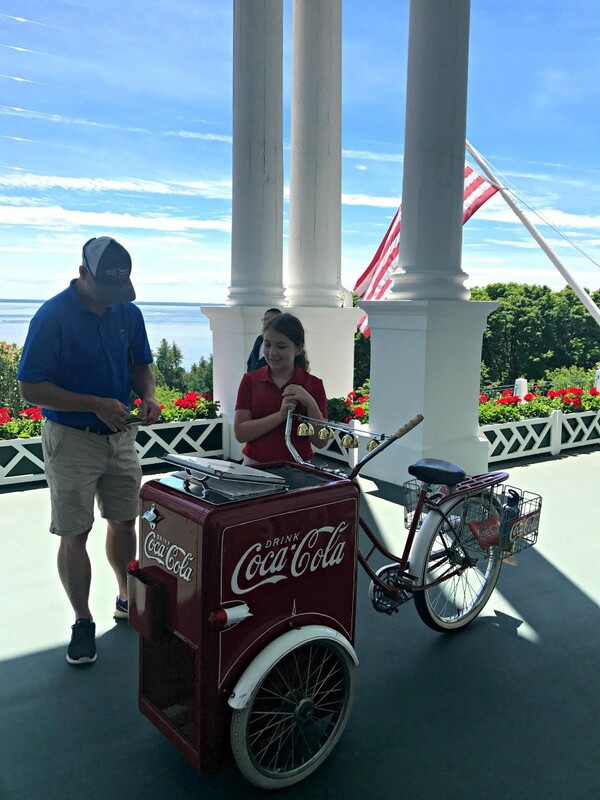 Don’t miss the opportunity to take a family photo on the rocking chair lined patio of the Grand Hotel, grab an ice cold coke or beverage, and take in the view of the Mackinac bridge! Do NOT miss the opportunity to enjoy the Grand Hotel up close! 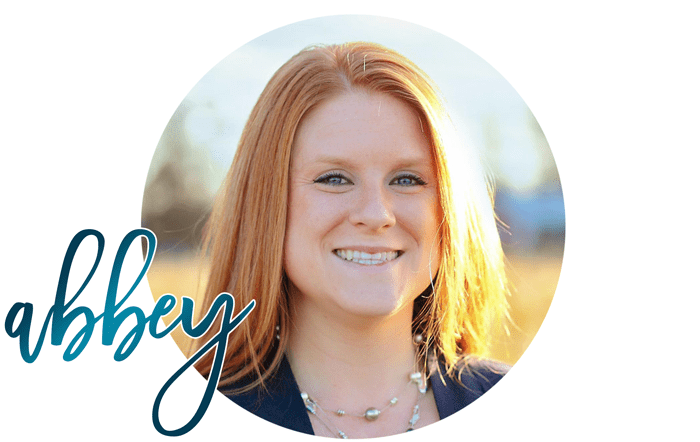 Run in, walk around the hotel, and enjoy lunch or at very least an ice cream cone in Sadie’s Ice Cream Parlor! 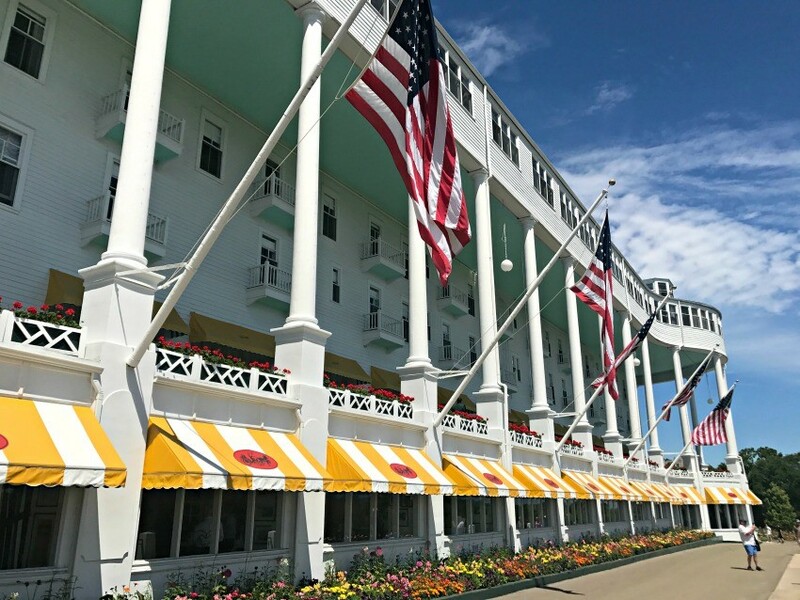 After visiting the Grand Hotel my son told me that he hoped he made enough money someday to bring his family there for lunch and my daughter asked me if it was her birthday! LOL Even the uniqueness was not lost on my children, they realized that the Grand Hotel dining room was a fancy and one of a kind experience and acted accordingly (for which I was very thankful). 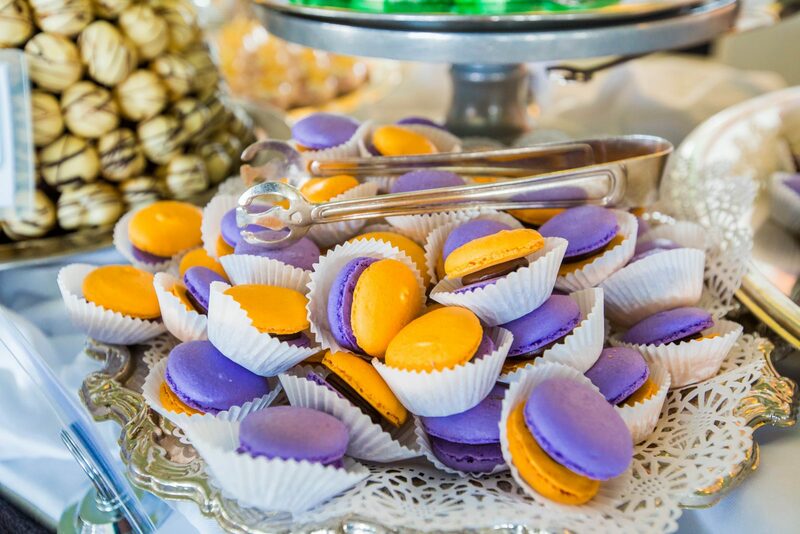 We ate ourselves silly and then tried ALL their amazing specialty desserts! 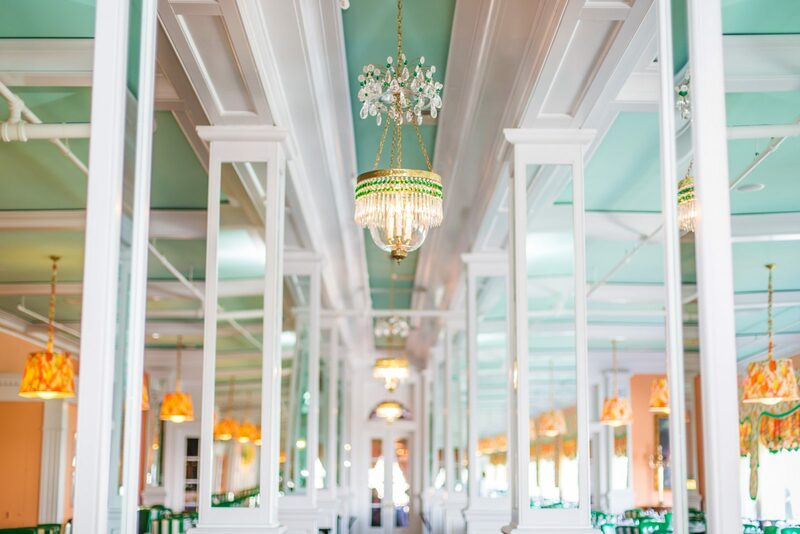 Get more information about the Grand Hotel HERE! So what’s the best day of the week to visit Mackinac Island, you ask? I’d suggest visiting during the week. We went on a Wednesday and had minimal traffic, very few passengers on the ferry, and no wait for anything. It was lovely. I truly feel like everyone should take the opportunity to visit Mackinac Island at least one time. It takes you back to another time and almost feels like a real life version of a Stepford Community with it’s beautifully manicured lawns, bright colored houses, and total and utter uniqueness. 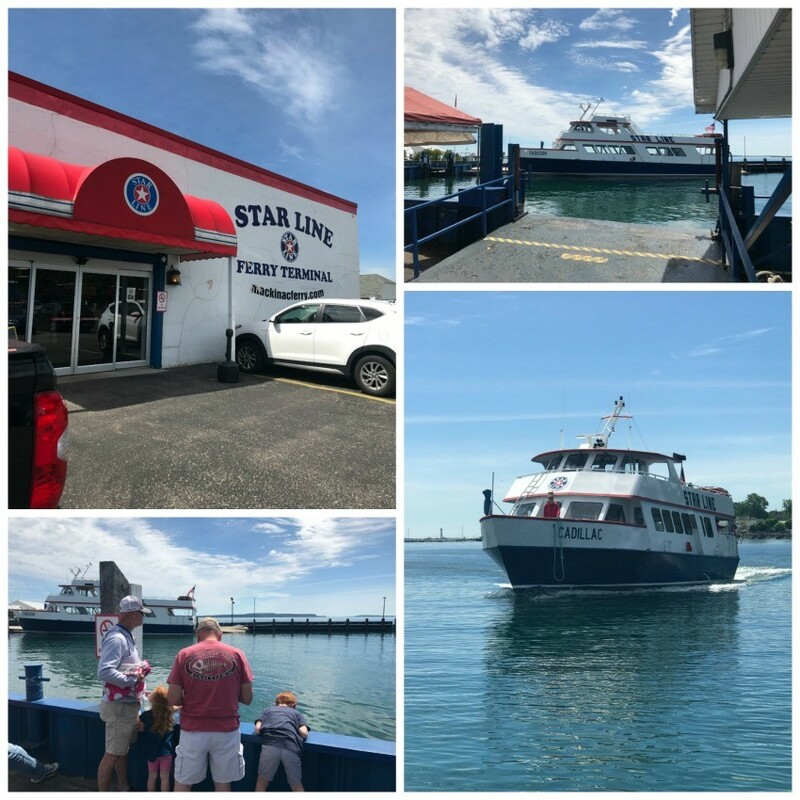 *Thanks to the Grand Hotel for hosting us for a special lunch and to Star Line Ferry and Ryba’s for providing us with complimentary rides during our visit! 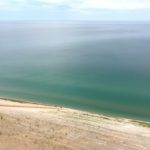 Check out this post for more tips on visiting Sleeping Bear Dunes in Michigan.